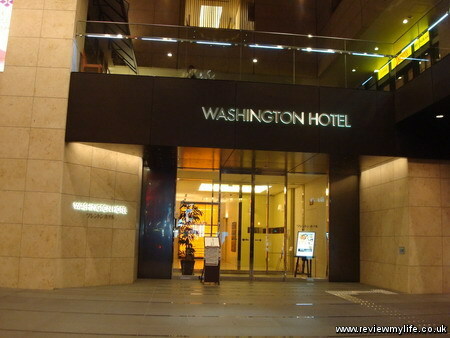 During a recent visit to Tokyo I stayed at the Akihabara Washington Hotel for 8 nights. Here are my photos and a small amount of information about the hotel. 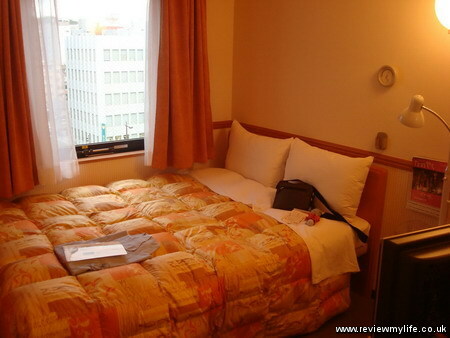 The hotel is in Akihabara on the East side of central Tokyo. It is a three minute walk from the JR Yamanote line – this is the line that circles central Tokyo and goes to many of the main places of interest. Also from Akihabara station is the Chuo Sobu line, which can get you to Shinjuku in a more direct way than the Yamanote line. This is what the double room looked like from the inside. The decoration is modern and functional. There is a free LAN internet connection if your bring your laptop. In the bathroom they had one of those heated mirrors that prevents steam from forming on the central part of it after you have had a bath or shower. 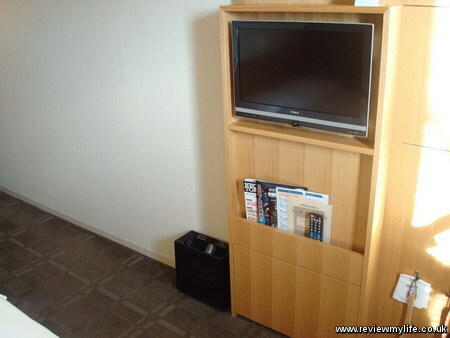 The TV is compact – it needs to be as the room is quite small. And the fridge is even smaller. It is only one carton deep, however you can still cram a fair bit in. Here I’ve got several drinks, sushi, rice balls and yogurt squeezed inside. 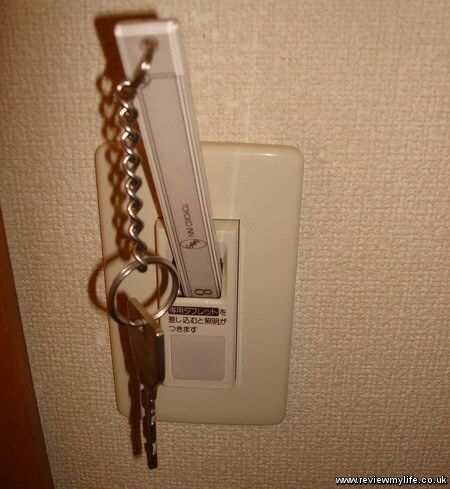 Instead of a traditional hanging ‘Do Not Disturb’ sign, the one here is magnetic, so it sticks on the door. In the hotel room was a pamphlet advertising a special ‘train set’ room which they have in the hotel. 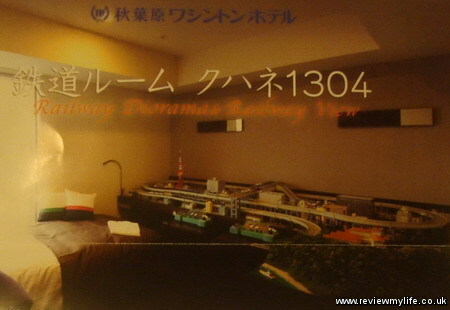 The English text says ‘Railway Diorama & Railway View’. As well as getting a train set in your room, you also get a good view of the train tracks which run near the station! I’ve no idea what this room costs, but if you are into that kind of thing this could be the hotel for you! Here’s the view out of the window. This room was on one of the upper floors. 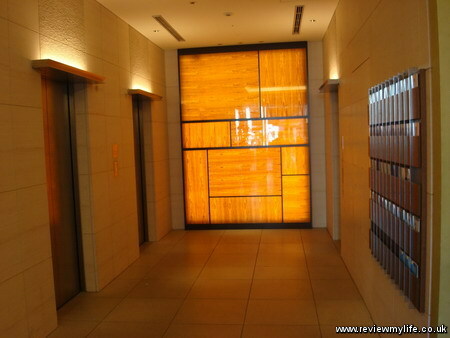 Here is the ground floor lobby which just contains the lifts. The reception is on the 2nd or 3rd floor. In the lift you have to press your room key to the card reader panel and then it takes you to the correct floor. You can’t access any floors other than the common floors, and the one you have a key for. And finally here is a view of the hotel building from the front at night. 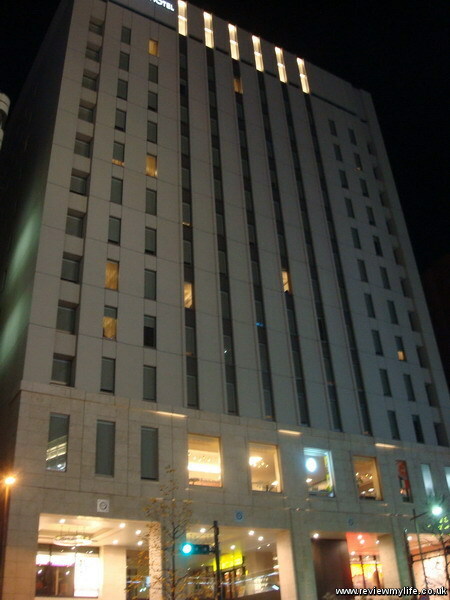 If you want to compare prices for this hotel you can look at the Akihabara Washington Hotel on HotelsCombined.com*. 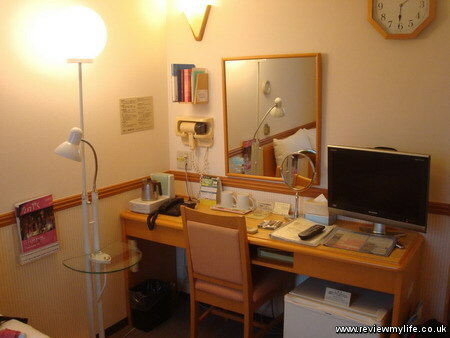 I recently stayed in two different Toyoko Inn (東横イン) hotels in Kagoshima and Nagasaki in Japan. 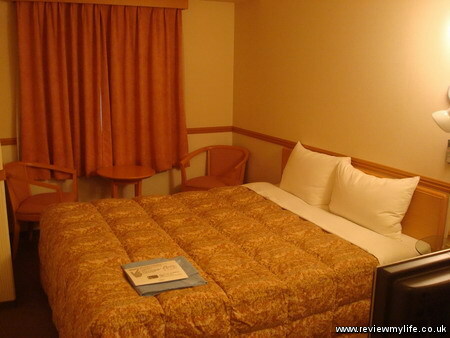 Toyoko Inn is a massive hotel chain; there are often multiple Toyoko Inn hotels in each city. 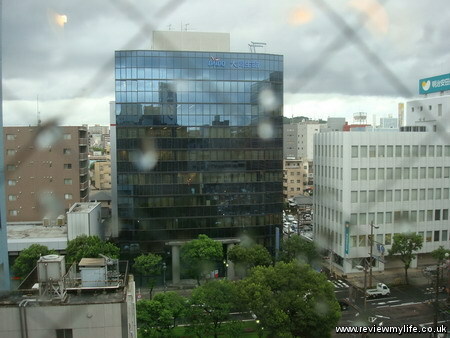 Below is the outside of the Nagasaki Toyoko Inn. Toyoko Inn is a budget business chain. The rooms are comfortable, but nothing special. 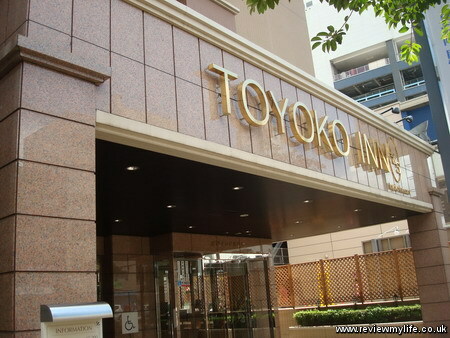 One thing you’ll notice if you stay in multiple locations is how similar all Toyoko Inn hotels are to each other. They look almost identical on the outside, the receptions look the same, and so do the rooms. If you want to stay somewhere unique this isn’t the place. 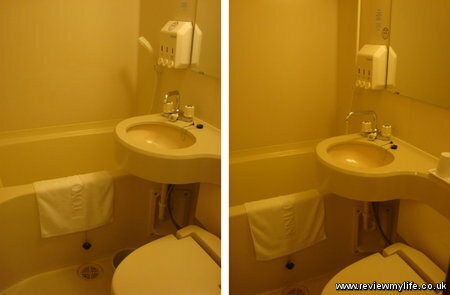 Below is the bedroom from one of the Kagoshima Toyoko Inn hotels, and below that is a photo from the Nagasaki Toyoko Inn. Pretty similar, and so is the room’s desk. The top photo is Kagoshima and the bottom is Nagasaki. 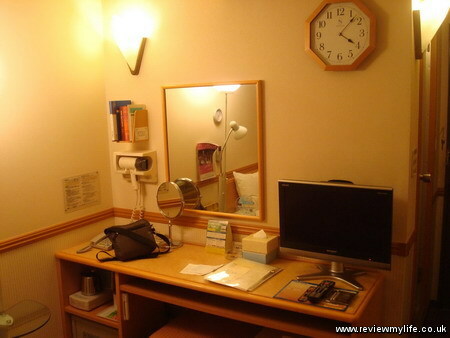 They have the same clock, TV, hairdryer, wall light, and collection of books. 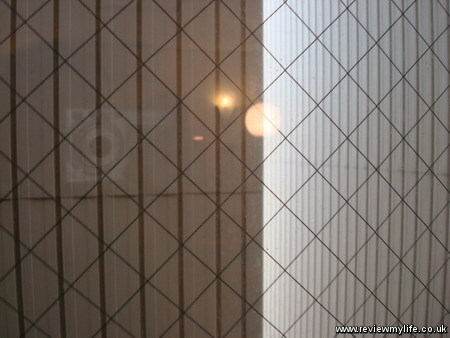 One area where the two hotels did differ greatly was in the view from the room. Here is the view from the Kagoshima room. Not spectacular, but acceptable. Here is the view from the Nagasaki room. Yes they have built a corrugated iron, multi-story carousel car park just metres from the window at the back of the hotel. This is the worst view I’ve ever had from a hotel room! 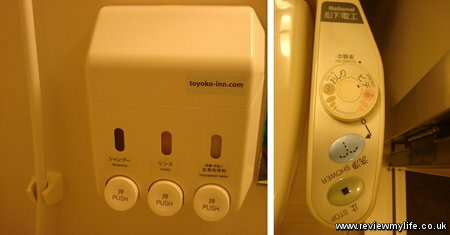 Here’s a zoomed in shot showing their standard shampoo / conditioner dispenser, and the toilet control panel. Most hotels have a ‘Do not disturb’ sign for you to use if you want to chill in your room while you are staying there. 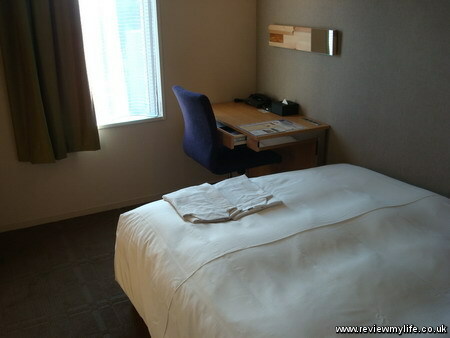 But not Toyoko Inn; they want you to be out of your room between the hours of 10am and 4pm – unless you phone the reception to tell them you are staying in your room. You can of course do this, but it is a bit of a hassle. Their check-in and check-out times match their ‘room no-stay’ times. Check in at 4pm and check out at 11am. Most hotels let you check in at 3pm and check out at 11am. If you are a business man and are only using the hotel to sleep before going to your early morning meetings then none of this will be a problem. 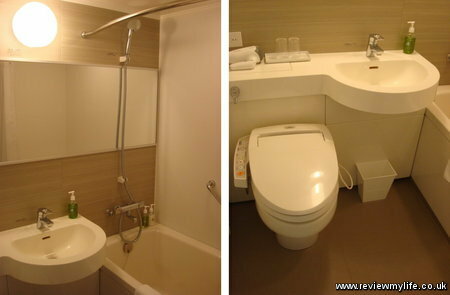 If however you are on holiday and want to relax the Toyoko Inn chain might not be for you. Breakfast was included. In both places there were rice balls and bread. 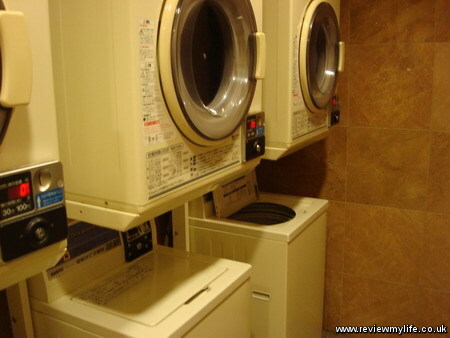 Each Toyoko Inn had a coin laundry with washers and dryers. Very handy if you are travelling light. Coin laundries can sometimes be a pain to find in Japan. The rooms were comfortable and functional. Nothing special, but this is reflected in the average price. The policy of vacating your room between 10am and 4pm unless you phone reception isn’t great if you want a long sleep, but many people wouldn’t think of being in their room at those times anyway. I don’t have any direct links for booking these hotels, but you can use the below links if you want to search for other hotels in either Kagoshima or Nagasaki.